Easy Instant Pot Chicken Breasts are tender, juicy and perfectly seasoned. A simple, tasty protein that makes lunch and dinnertime a breeze! Add Italian salad dressing and garlic. Seal plastic bag. Move chicken around in the marinade to get an even coating, then place in the refrigerator for at least 2 hours (overnight is best). When done marinating, place chicken on a plate and discard marinade. 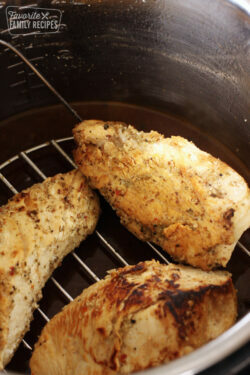 Combine chicken seasoning, salt and pepper in a small bowl and generously rub evenly over chicken breast. Set Instant Pot to "sauté" and spray with cooking spray. When the Instant Pot becomes hot, place each chicken breast on the bottom of the pot and sear for 1 minute on each side or until golden brown. Remove chicken from Instant Pot and pour chicken broth in the bottom of the pot to deglaze, scraping any browned bits off the bottom if needed. Cancel the saute function. Place trivet in the bottom of the pot over the broth. Set instant pot to "Manual" and set to high pressure for 6 minutes (if cooking larger chicken breasts you may want to increase this time by 2-3 minutes). After it is finished cooking allow to natural release for 5 minutes before flipping the quick release. Allow chicken to rest 3-4 minutes before slicing.